EUR/USD continues moving down as the USD moves up. The global slowdown is favorable for the US Dollar. The technical picture turned bearish for the pair. EUR/USD is trading closer to 1.1400, extending its falls. The primary narrative in markets is that the US is the “cleanest shirt in the dirty pile.” While the US central bank turned dovish, the economy is still outperforming the rest of the world. This outperformance was reflected in the upbeat Non-Farm Payrolls report on Friday. And how is the euro-zone doing? The Sentix Investor Confidence published on Monday dropped to -3.7, reflecting growing pessimism. The final euro-zone Services PMI came out at 51.2, for January, an upgrade from 50.8 reported initially. However, the number is hardly above the 50-point threshold that separates growth from contraction. It is far from 57.6 seen in the US in December, with no significant changes expected. See: US Services Purchasing Managers’ Index: Shutdown, what shutdown? Not all is rosy in the US: Factory Orders dropped by 0.6% in December, worse than had been expected. Nevertheless, the American economy is still on top. Apart from the ISM data from the US, markets await President Donald Trump’s State of the Union speech in the early hours of Wednesday. Any mention of infrastructure spending and tax cuts could boost markets. On its way down, several indicators turned bearish. EUR/USD crossed both the 50 and 200 Simple Moving Averages. Losing both lines at once is a bearish sign. Also, Momentum turned negative after quite a few positive days. The Relative Strength Index is leaning lower but has not reached oversold conditions just yet. All in all, the bears are in control. 1.1405 was a swing low in late January and is followed by last week’s low point of 1.1390. Further down, 1.1340 was a low point in mid-January. 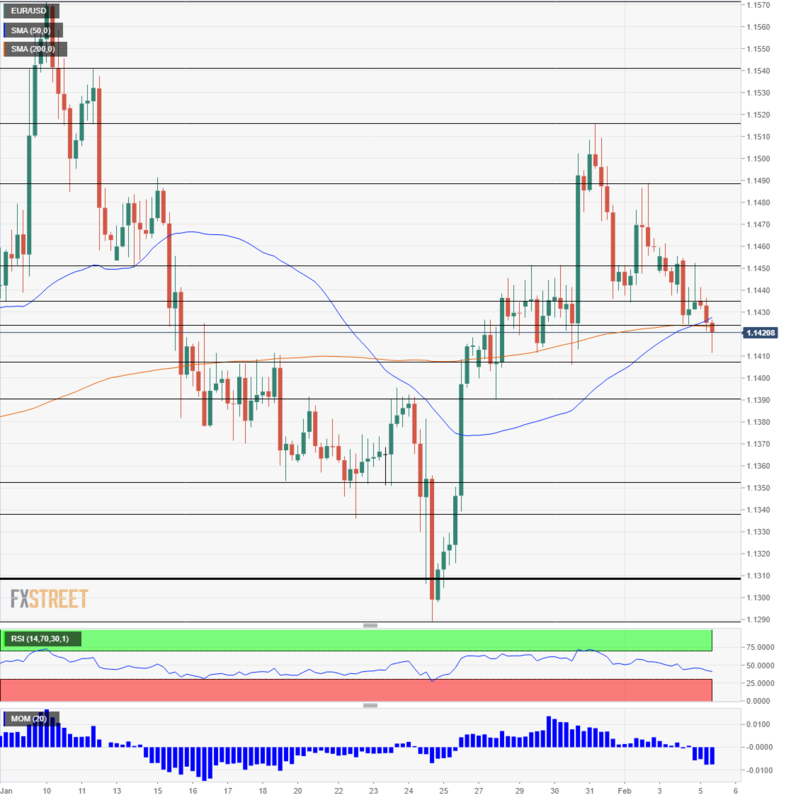 1.1310 was a double bottom back in December, and 1.1290 is the 2019 low. Looking up, 1.1430 provided support in late January, and 1.1450 capped the pair beforehand. 1.1490 was a swing high in the wake of the new month, and 1.1515 was the post-Fed peak.